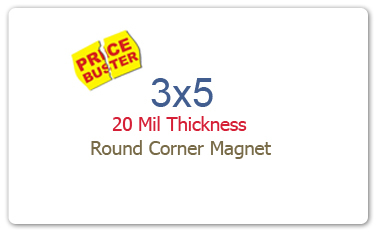 A promotional 3x 5 inch printed round corner full color magnet is best bet for investment to all those marketers and individuals, who have high expectations from their low budget campaigns. This magnet offers larger working space for advertisers to work upon and highlights their business messages with ease. A custom 3x5 inch printed round corner full color magnet can be sought for brand building by newbie advertisers and established ones, who are targeting new customer base. This magnet can be creatively altered as a calendar magnet, business card magnet, and announcement magnet – or in any other form, which may interest a viewer and inspire him to retain it with all his choice. A personalized 3x5 inch printed round corner magnet is highly affordable and can be sought for bulk gifting during promotional events and social events. Product Size : 3 in. x 5 in.